One of the hallmarks of the neo-liberal age has been the exponential expansion of commercial spectator sport – in its economic value, political role and cultural presence. All of which will be thrown into high relief during the coming World Cup. In recent years, the industry has grown in all regions above the local GDP rate, and is estimated to have generated $135 billion in direct revenues in 2013. These revenues derive from four elements: gate receipts, corporate sponsorship, media rights and merchandising. Revenues from sponsorship and media rights have grown fastest and together now make up over half of total revenue. But whereas in North America and Europe, gate receipts remain the single biggest source of revenue, in the BRIC counties and in Asia as a whole sponsorship is now the biggest money-spinner, accounting in China for 48% of total sports revenues. Meanwhile, though merchandising is marginal in most of the world, it is significant in north America, where it accounts for 25% of revenues. Despite its growth, the sports industry, narrowly defined, is still dwarfed by the pharmaceutical ($1.1 trillion a year) and automotive ($1.8 trillion) sectors. But direct revenues tell only a part of the story. Sport is interwoven with other industries: footwear, sportswear, soft drinks, advertising, among others. It’s a central driver in media industries – print, broadcast and digital. And it’s critical to the gambling industry, legal and illegal, with betting on sports estimated to be worth between $700bn and $1tn a year. Sport has become a fertile zone of capitalist intersection and mutual aggrandisement. It should therefore not be surprising that it has also become a major carrier of neo-liberal ideology, used to promote a competitive individualism in which the pursuit of victory and success is presented as the purest form of personal self-expression. Nike is the obvious example, with its injunctions to “just do it” and “risk everything” and its strategic linkage to sports superstars. What is celebrated is a “triumph of the will” – in which adverse circumstances are made to bow to individual desire. It’s a version of what has been described as “magical voluntarism”, identified by Mark Fisher as a key component of today’s dominant ideology. It needs to be said that this ethos of egocentric assertion is by no means inherent in sport, which is not about ‘the law of the jungle’ or a ‘war of all against all’. On the contrary, it’s a competitive activity built on a cooperative basis, requiring mutual agreement among competitors and between competitors and spectators. And it is intensely regulated; in fact, without the regulation, the sport vanishes. Team sports, of course, set a premium on interdependence and a willingness to sacrifice individual priorities for the good of the collective. But even the most successful individual competitors are what they are only because they enjoy a network of personal and social support. No one can ever “just do it” on their own. One of the favourite metaphors of advocates of capitalist globalisation is borrowed directly from sports. They hunger for a world-wide “level playing field” in which competition flourishes freely and fairly. However, as in so many spheres, the impact of neo-liberal globalisation on sport itself has been to create an increasingly uneven playing field, marked by widening inequalities. As the major male sports swallow an ever increasing share of sports revenues and investment, other sports are pushed to the margin. In south Asia, cricket is so dominant that it has rendered hockey, at which India and Pakistan excelled for decades, nearly invisible. While women’s sports have enjoyed increased revenues in absolute terms, the growth of male sports means that women still receive only 0.5% of corporate sports sponsorship. Elite male European football now accounts for more than 35% of global sports revenues; a similar share goes to the Big Four North American team sports (baseball, basketball, ice hockey and American football). Within European football, the five biggest leagues comprise half the total market and the top 20 teams one-quarter of that market. The English Premier League breakaway in the early 90s has proved to be a watershed. The big clubs’ main motive was to maximise their share of broadcasting revenues. Since then, the tendency has been for the rich teams to get richer, while the rest face perpetual insecurity. In effect, the billionaire backed clubs are now hoarding the best players, making it even harder for others to compete with them. UEFA has introduced its Financial Fair Play rules in an attempt to restrain the growing inequality, but they are unlikely to affect the overall imbalance. Meanwhile, European football recruits extensively from Latin America and Africa, whose domestic competitions are thereby weakened. Compounding the talent drain, globalised broadcasting has in many regions made Europe’s big clubs more famous and more widely followed than local teams. The general trend towards a concentration of wealth and power is neatly illustrated by recent events in world cricket. Earlier this year, the three richest cricket boards – India, England and Australia – combined forces to impose a new order on the ICC, the game’s governing boy. From now on the Big Three will take home a larger share of the game’s global revenues, dictate unilaterally which other teams they’ll play and how often, and wield an effective veto on all ICC decisions. There’s also a plan to introduce a two division structure for Test cricket, with a telling wrinkle in the scheme: none of the Big Three are ever to be relegated to the second division. So their standing in the competition will be guaranteed not by the quality of their cricket but by their financial clout. Unpredictability and spontaneity are at the heart of sports, and they are at odds with the capitalist drive to maximise profits and eliminate variables. An extreme example is bookmakers who seek to fix results, thus guaranteeing the return on their investment. But sponsors too would prefer some WWE-like scripted entertainment: no annoying upsets or injuries or mysterious losses of form to compromise their projections. The problem for them is that their property would forfeit all value should it be seen to be scripted. So there’s a tension between capitalist imperatives and sporting imperatives. In fact, the whole idea of sports competition as a mirror or metaphor for capitalist competition is misconceived. The ‘level playing field’ in sport is constituted by a rigid scaffolding of rules without which the competition dissolves. Capitalism’s version is a deregulated arena of limitless accumulation. The aim of capitalist competition is to eliminate (or acquire) the competitor. In sport, you need the opponent to survive and return for the next match or season, which always begins the contest afresh. And of course, what’s at stake in the two types of competition is fundamentally different. The penalties for coming second do not compare. All the contradictions of commercial spectator sport will be on display, in heightened form, in this year’s World Cup. Dave Zirin, in his invaluable new book, Brazil’s Dance with the Devil, shows how this sporting mega-event has become a carnival of state-sponsored neo-liberalism, characterised by mass evictions, gentrification, increased repression and surveillance, vast expenditure on redundant facilities and corporate plundering of public funds. 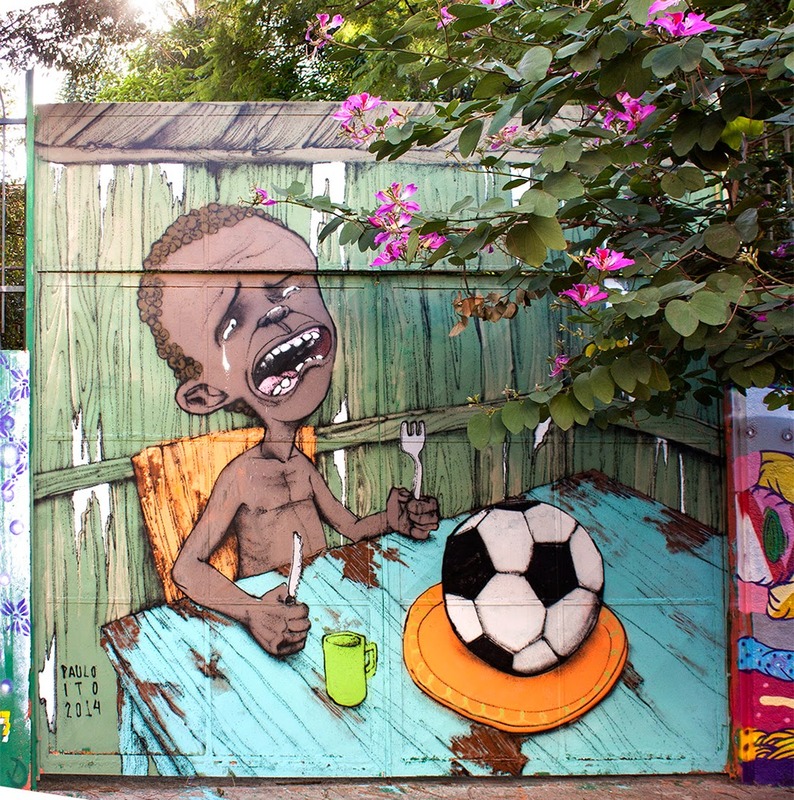 It’s a boon for the construction, property, security and media industries, but a bane for many others, as was demonstrated last year, when huge numbers of Brazilians took to the streets to protest against the World Cup priorities that have skewed the country’s development. World Cup boosters claim that once the competition is underway and “the ball is rolling” all the discontents will vanish. What’s certain is that there will be a concerted effort to convince us that this is so. Those who persist in talking about the social cost underlying the festivities will be condemned as killjoys and nay-sayers. We are cast as consumers and nothing but consumers, expected to imbibe the corporate-branded spectacle without qualms or conscience. In that context, engaging critically with sports, seeing them as part of the broader human current, becomes a necessary subversive act. FIFA and its corporate partners have a vested interest in promoting tunnel vision, but the rest of us do not. Enjoyment of the football and critique of its context can and should go hand in hand. The idea that one excludes the other is a myth we need to shed. Mike Marqusee is a political activist and writer who writes on politics, culture and sports. He has authored several books including "Redemption Song: Muhammad Ali and the Spirit of the Sixties"; "Chimes of Freedom: the Politics of Bob Dylan’s Art" ; "If I Am Not for Myself: Journey of an Anti-Zionist Jew"; "Street Music: Poems by Mike Marqusee".